← Market Timing Brief for the Gold ETF (GLD) and 10 Year Treasury Yield (TNX) Closes On 4-04-2014: Gold Limps Off a Higher Low. Rates Hold Their Range. The SP500 Index (SPX, SPY) broke out after Dr. Yellen jawboned on monetary policy and then the market gave it all back, failing a breakout as shown on the chart. 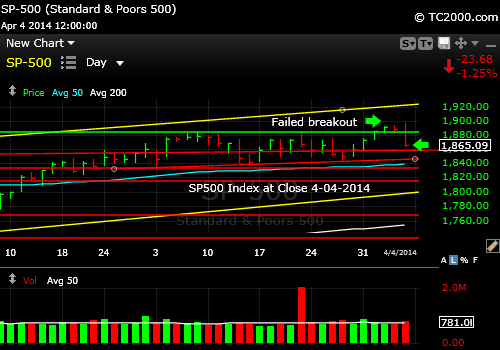 SP500 Index having a hard time making and holding a new high. This is a failed breakout. This is not a significant SELL signal with our longer term perspective here, but it’s an opportunity for short term traders and also for shorts attacking Facebook (FB) and grossly overvalued stocks like it. Free Subscription to My Newsletter and access to my latest comments I’ll send you back the password to the access page and the monthly newsletter in the same email. This entry was posted in investment, large cap stocks, S&P 500 Index and tagged Facebook, FB, market timing, sp500 index, spx, spy. Bookmark the permalink.